CBC News has learned more details about Thursday's federal budget, as Finance Minister Jim Flaherty tries to allay fears it will translate into severe service cuts. 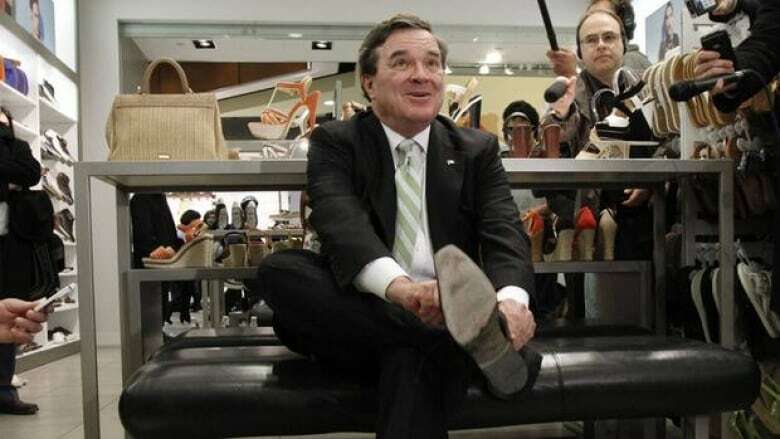 Finance Minister Jim Flaherty tried to allay worries that the federal budget he'll bring down Thursday will translate into severe service cuts. When asked whether reports of $7 billion in spending cuts were on the mark, Flaherty said the cuts would be "moderate, modest," but would not be more specific. He said his budget would not be as "draconian" as the ones the Liberals brought down in the mid-1990s. "Reducing spending in the provinces for health care, for education, for social services — we're not touching any of that," he told reporters while trying on a traditional new pair of budget shoes Wednesday. "The majority of the spending review reductions relate to back-office operations in government. They don't relate to service delivery by government." The budget's theme is "jobs, growth and long-term prosperity." Spending cuts will be closer to $4 billion – or five per cent of spending – than to the $8 billion target previously floated. The budget will detail how much each department will be cutting, but will not include details of the specific programs that will be cut. It will set out ways to reduce the cost of public service pensions, with a number of options available to bring them more in line with the private sector by increasing the amount employees pay. Some details of spending cuts were already revealed on Wednesday by the Board of Internal Economy, the governing body of the House of Commons. It issued a memo to all MPs telling them the budget for the House of Commons is being slashed by $30.3 million, or 6.9 per cent of the total budget. The cuts will be phased in and fully implemented by 2014 - 2015. The office budgets for MPs will be cut by a total of $627,000 per year, for eventual savings of $2 million; a fund for office furniture in local constituency offices is being scrapped and other changes are being made to travel rules that are designed to save money. Ottawa has asked federal departments and agencies to come up with budget-saving scenarios of five per cent and 10 per cent, which could mean up to $8 billion in cuts to programs and services, leading to nervousness about how some Canadians might feel the pinch. The budget is expected to contain precious few details about precisely which jobs and programs will be lost, meaning Canadians won't know the full effects for several months. Some are warning that the spending blueprint will harm services and put the public at risk, while others, including Flaherty himself, are insisting that the austerity will not be painful. Get details of Thursday's federal budget first on CBCNews.ca, CBC News Network, CBC-TV and CBC Radio and on your mobile device. CBCNews.ca will have a special live page starting with pre-budget coverage at 2 p.m. ET on our live blog and livestreaming video of Power & Politics' pre-budget special. At 4 p.m. ET, find full budget details plus streaming video of Finance Minister Jim Flaherty's speech in the House of Commons plus CBC News special coverage with Peter Mansbridge. Stay with CBCNews.ca for live chats during and after the budget speech and for more coverage on Power & Politics with Evan Solomon 5 p.m. to 7 p.m. ET. Glen Hodgson, chief economist at the Conference Board of Canada, expects most of the cuts to be in the government's administrative ranks and to unpopular programs rather than front-line services. "I think in the near term what we're going to see is compression of the number of public servants, levels of employment, compensation models — a much smaller operating model for the core federal government. And then there will be a trickle-out effect for a lot of other programs." However, Hodgson added, some of the budget's effects will simply be deferred. Changes to Old Age Security benefits, for example, are expected to be phased in over several years. The budget is expected to lay out new policy directions, he said, that will ultimately change the government's role in the lives of Canadians. In the short term, observers say, the federal deficit for the current fiscal year — which ends in three days — will likely come in far lower than the $31-billion estimate the government released in November. Royal Bank chief economist Craig Wright predicted earlier this week the deficit could shrink to the $20-billion to $25-billion range — enough to allow Ottawa to balance its books a year or two earlier than its current 2016-17 projection. The opposition leaders have their doubts that the cuts will be judicious. "This is going to be a government that's going to continue to cut," interim Liberal Leader Bob Rae said Wednesday, predicting cuts in environmental research, services and pensions. "This is a government that can't even mention the word 'inequality,' that can't mention the concept of the growing gap between those who have and those who don't." Thomas Mulcair, the new NDP leader, says he has little confidence the government will show much restraint in its cuts. "The whole pyramid of public administration exists to do one thing: to deliver a service to the public. That's the last thing you should touch. You should, if you have to do some paring down, go after the administration itself. So instead of going at it with a scalpel they'll go at it with a rusty machete, and I'm concerned we are going to lose a lot of public services." Public service unions in Ottawa have pointed to recent cuts by the government as examples of how the budget could hurt Canadians. Last spring the government announced it would close a marine rescue subcentre in St. John's and move services over a thousand kilometres away. Merv Wiseman, a search and rescue co-ordinator in St. John's, says the government didn't consult anyone before the move. "This is the centre that has the highest rate of distress calls of anywhere in Canada.… It is a reckless decision that puts a price on the lives of people who have to work in the most volatile and hostile environment in the world," he said. Recent job cuts at Service Canada also caused controversy when employment insurance cheques were delayed for months. Earlier this year the government backtracked and said it would rehire some of the staff. Some experts say the government has learned from those mistakes and is unlikely to repeat them on a larger scale with the federal budget. "They're going to do their level best to make sure the cuts aren't felt by Canadians across the country," says Ian Lee, a professor at Carleton University's Sprott School of Business. He believes most of the cuts will be to administrative and policy staff who work largely behind the scenes — for example in government real estate, procurement or defence support. "I think the cuts are going to fall disproportionately on the back office where they are not going to be seen or felt by the Canadian public." Meanwhile, many public servants in Ottawa are bracing for staffing cuts, which may not arrive through relatively painless attrition or early retirement packages. Andrew Graham, a professor in the school of policy studies at Queen's University in Kingston and a former assistant deputy minister at Agriculture Canada, doesn't think the government will be generous. "Sweetening the deal is going to accelerate the departure of people you don't want to go," he said. Graham said he's heard the federal job cuts will hit Ottawa hardest, since the centre has seen the biggest growth over the past few years.